1. Pour the milk into the saucepan and place on the stove. Heat milk over medium heat until it steams and bubbles form around the edge. Let cool for 10 minutes. 2. Place the yeast, 5 cups flour, 1/2 cup sugar, and salt into a large mixing bowl and mix. Add 2 tablespoons of the butter and the cooled milk. Stir until a stiff dough forms. Add in additional flour if needed. 3. Flour a clean work surface. Remove the dough and place on floured surface, sprinkle a little additional flour on top. 6. Remove the dough from the bowl and punch down. Shape back into a ball and allow to rise (yet again) for 30 minutes. 7. Rub some butter into the bottom and sides of 2 loaf pans (about 4″x 8″). 8. Place 4 tablespoons of the butter, the remaining 1/4 cup of sugar, and the 2 teaspoons of cinnamon into a small mixing bowl and combine. Takes a little effort, but it eventually comes together. 9. When the dough has risen for the second time, sprinkle a clean surface with flour and move the dough to the surface. Using your hands, flatten dough into a rectangle as thin as you can get it. 10. 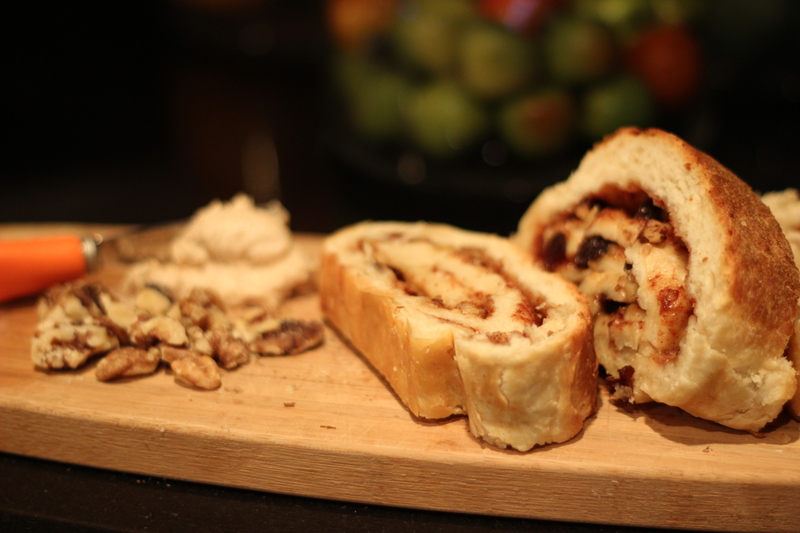 Spread the butter mixture onto the dough, and then sprinkle with the raisins and walnuts (if using). 11. Starting along one edge, roll the dough as tightly as you can (should make a very pretty spiral in the center). Cut the dough in half to make 2 loafs and place seam-side down in the buttered pans. Cover with the kitchen towel and (you guessed it) let the loaves rise for (another) 30 minutes. In the meantime, preheat the oven to 350 F.
12. Spread the remaining 1 tablespoon of butter onto each loaf. Place on the center rack in the oven and bake for about 35 minutes. They give a great tip and say to bake until the bread sounds hollow when you lightly tap on it. 13. Remove bread (don’t forget the mitts!!) and tip each loaf over to allow it to slide out of the pan. Cool on a wire rack. They suggested serving thick slices with cream cheese – but I though, why not take that a step further? Enter…cinnamon cream cheese…oh yeah. Seriously, you have to try it.